and internships for technical and non-technical students. We’re relaunching the My Summer @ Google series to give you an inside look at each of these programs, hearing from the students themselves who participated. Today John Yang-Sammataro, a current computer science student at Stanford University, recaps Google’s Android Camp. Android Camp is a week long interactive program where students work in teams to build Android applications. When I heard that I had the unique opportunity to have hands on training with the team that builds Android, I jumped at the chance. Nearly everyday for the past two years, I have walked past Larry Page and Sergey Brin's original Google server, which sits in the Huang Engineering Building at Stanford. However, this summer was the first time I visited the Google headquarters that the two famous internet entrepreneurs founded after their time at Stanford. I began the camp aiming to learn as much as I could about Google’s latest cutting edge mobile technology, but came away with a richer experience than I ever expected. Each day we familiarized ourselves with the Android ecosystem through a whirlwind of workshops and activities. These were paired with daily team breakout sessions during which we applied our new skills to build apps. The Android team is really passionate about what they do. It is quite something else to ask a question about a software platform you are working on and receive a response from someone who can speak in the first person about why they developed the software that way! At the end of the week we presented our apps to a panel of Google engineers for critiques and feedback. I have never learned so much in my life within seven days! With so much software development, it is hard to believe that we had time to do all the additional activities that the Android Camp team put together. Each day included a unique activity outside of the classroom lessons. We cooked pizzas, sampled delicious food at a different Google cafeteria every night, and even toured San Francisco finishing the evening at a Giants baseball game. Touring Google’s campus, we marveled at beach volleyball during break hours, the company’s fleet of shuttles and bikes, and even a free medical clinic. The genuinely energetic and motivated environment at Google's HQ reminded me that Google company culture is as much a colossal achievement in human resources as its products are technical marvel. What impressed me most was that the Googlers and fellow campers I met were some of the most interesting and genuine people I have befriended. Each and every person had their own unique story and passion behind what they did. Even after twelve hours of coding and activities each day we would come back to our hotel and delve into conversation, not just about computer science but everything from politics to physics to startups to hometowns and underwater sea cables. After a week of Android Camp I now have a technical familiarity and high level understanding of not only the Android ecosystem, but the wide array of open source software and public Google APIs that might take me months to learn otherwise. Now I am planning to build the main Android app for the company I am interning with this fall and our Android Camp team, Object Oriented, is working to launch our app on Google Play in a couple months. However, what I will keep for years to come are the memories of late night conversations woven about life, Dalvik, and underwater sea cables and the friendships with the people who started them. Thank you to the Android Camp team and my fellow campers. You made Android camp an unforgettable experience. Interested in Android Camp? Check back here in early 2013 for next summer’s application. Introduction: Over the summer we host a variety of programs and internships for technical and non-technical students. We’re relaunching the My Summer @ Google series to give you an inside look at each of these programs, hearing from the students themselves who participated. Today John Yang-Sammataro, a current computer science student at Stanford University, recaps Google’s Android Camp. 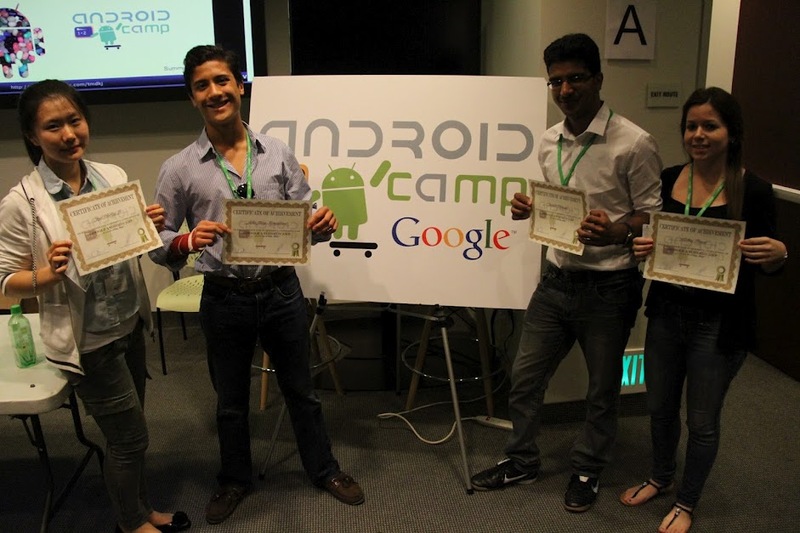 Android Camp is a week long interactive program where students work in teams to build Android applications. Very Nice And Informative Blog For Android Development era. I am Android Developer from Aegis Global Software, i would like to develop application, software and websites.